A new concept from Metzeler has hit our radar, which targets large displacement Dual Sport bikes that spend a large portion of their time in the dirt. 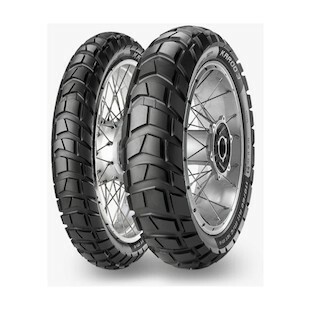 Named after the desert region of South Africa, the Metzeler Karoo 3 Tires sport an aggressive block tread that is composed in a pattern that still supports street use. An internal poll here at RevZilla revealed several differing opinions on how to classify this tire. The majority answered 70/30 street, while some heavily argued for 50/50. For the sake of argument, lets call this one a 60/40. An innovative trapezoidal tread ensures progressive off road traction regardless of lean angle. However the strategic geometry of the tread blocks allow for smooth use on-road as well. While not as smooth as a street tire, the stability of the Karoo should be surprising and the vibration greatly reduced compared to other dual sport tires in this class. In addition to this unique pattern, the rubber compound has been engineered for more mileage both on road and off. Another stake in the game for Metzeler! We are anxious to mount a pair of these and put the Karoo 3 tire claims to the test.